Set along a curving street, this shimmering, bejeweled building rises like the first tier of an unfinished wedding cake, thickly frosted and set with sugary decorations. 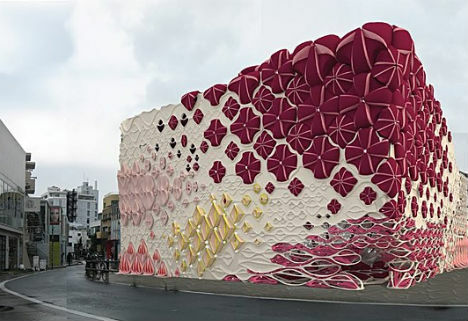 While, from its appearance, you might expect this to be a sweet shop or perhaps an unusual boutique, it’s actually an urban nightclub with a sushi restaurant and sake bar – located, fittingly, in Tokyo. ‘Urban Interiorites‘ is the work done under University of Pennsylvania School of Design professor Ali Rahim by Tiffany Dahlen and student Virginia Melnyk. Think the exterior is extravagant? 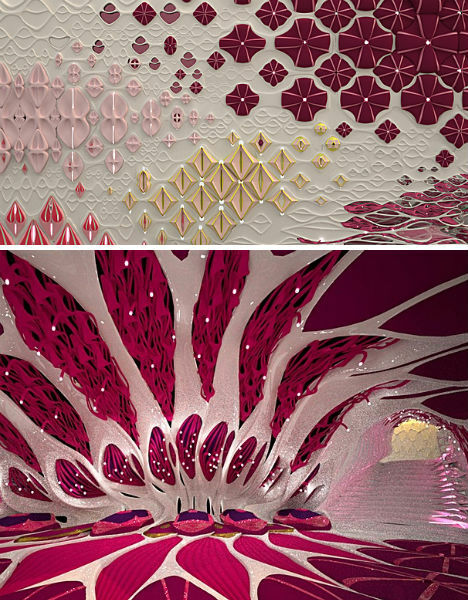 Take a gander at the inside, which has the feel of stepping through an alien flower patch into a cartoonish wonderland. 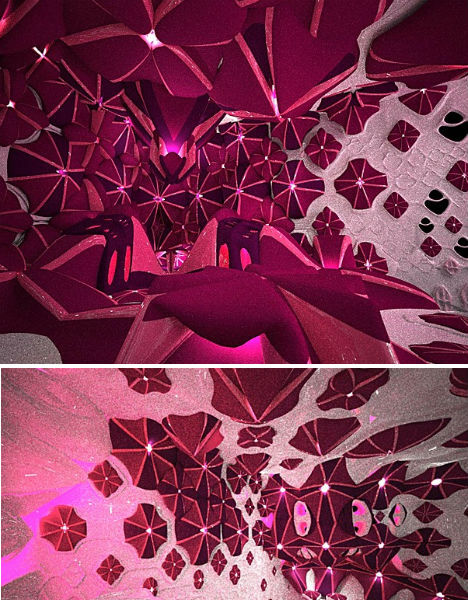 You’ll pass through a crystalline hallway down a glittering set of stairs into a fuchsia lounge filled with amorphous, organic furniture. 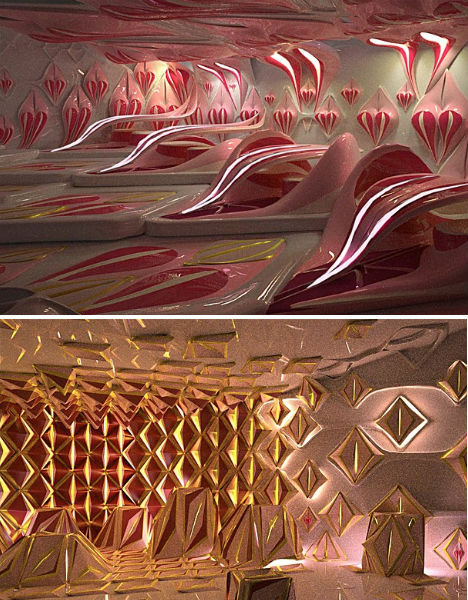 Pink bud-like protrusions line the walls and ceiling. The sake bar is a golden inner sanctum, dark and geometric, reminiscent of the seed pattern of a sunflower; the sushi restaurant is at once floral and fleshy with tongue-like tables that swoop from the walls down to the ground. This impression may indeed be intentional, as the designers wished to give the restaurant a feel of ‘salivation’. Found along the shopping strip of Omotesando in Tokyo’s Harajuku neighborhood, Urban Interiorites reflects the outlandish fashions often displayed by local residents, which have influenced the likes of singer/designer Gwen Stefani.